Lunar Flashlight is an exciting new mission concept that was recently selected by NASA's Advanced Exploration Systems (AES) by a team from the Jet Propulsion Laboratory and the Marshall Space Flight Center. 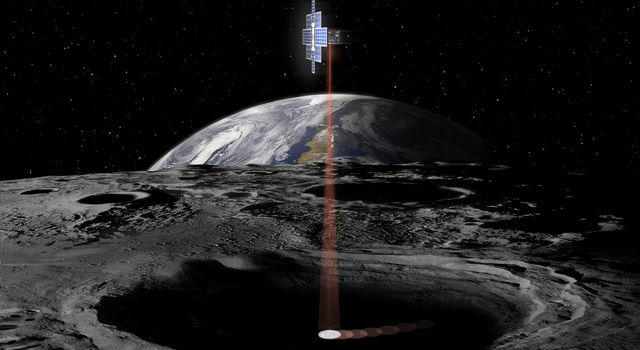 Planned to launch on the Space Launch System's Exploration Mission-1 (EM-1) flight, this innovative, low-cost secondary payload concept will map the lunar south pole for volatiles and demonstrate several technological firsts, including being the first CubeSat to reach the Moon, the first planetary CubeSat mission to use green propulsion, and the first mission to use lasers to look for water ice. The first flight of NASA's new rocket, the Space Launch System (SLS), will carry 13 low-cost CubeSats to test innovative ideas along with an uncrewed Orion spacecraft in 2018.